Two men who were both convicted of sexually abusing a young girl - one of them her father and the other her uncle - were jailed yesterday at Londonderry Crown Court. The victim, who was first abused by her uncle when she was aged four before she was then abused by her father when she was aged 10, yesterday waived her right to anonymity in order to have her abusers named publicly for the first time. Her father, 58-year-old former Irish army soldier Gerard Thomas Scarlett from Glendale Park in Londonderry, maintains his innocence and has instructed his legal team to appeal against his conviction. Scarlett was found guilty in July of this year on three charges of indecently assaulting his daughter between October 1995 and October 2001. He was jailed for 10 years. 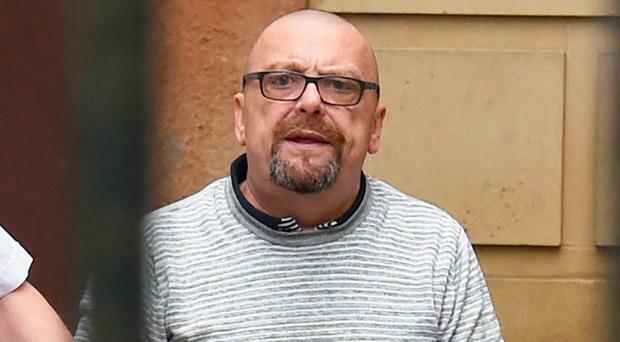 The victim's uncle, who was convicted by the same jury of two charges of indecently assaulting his niece over a two-year period starting in October 1989, prior to the abuse by the girl's father, is Martin Burke (46) from Creggan Heights. He was jailed for five years. Burke still denies his guilt but does not intend to appeal because he said he did not want to put his niece through further court appearances. Judge Philip Babington said both men had subjected their victim to a period of appalling abuse. "As far as the defendant Scarlett is concerned, his offending and the facts behind it are horrifying as they relate to his own daughter who he knew had already been abused by his brother-in-law," he said. "He chose to do nothing about that abuse because he wanted to do something similar. "He then abused his daughter over a two-year period and again when she was aged 14 or 15 abused her in a horrific fashion at a particularly sensitive time in her life." Judge Babington said the abuse, which was carried out in the victim's family home, was a gross abuse of trust by both defendants. "Burke deliberately frightened her with threats regarding witches, and her father threatened her saying that he would shoot her and then himself and that she would be responsible," he said. "It is also clear that she has suffered over the years, as set out in her victim impact report. "It is an aggravating feature of the offending that abuse took place in her own home and indeed on occasions in her own bedroom. A child should feel and be safe in such places." Judge Babington said that the "actual abuse was particularly serious". He said the victim was so frightened of her father's continued abuse of her that she used to put step ladders or an ironing board against her bedroom door. During one period of abuse, the victim pleaded with her father "please don't" but her father continued with the abuse and told his daughter "you like it". The victim made an official complaint to the police in 2013. When interviewed, Burke described his niece's allegations against him as rubbish and lies. Her father also told the police that the allegations were rubbish and said he had definitely not abused his daughter. Judge Babington said he had read a victim impact statement from the victim. "I also saw and heard her give her evidence in this case from the witness box," he said. "She was obviously very upset at times giving her evidence and it was clear that she has suffered a great deal both at the time of the abuse, since it and when giving her evidence. "It is also clear that her children sustain her as she gets on with day-to-day life. "Neither defendant is entitled to any credit as they put her through the rigours of a fully contested trial where she was subject to detailed cross-examination," Judge Babington added. As well as jailing the abusers, Judge Babington also subjected them to the notifications of the Sexual Offences Act 2003 for an indefinite period and further banned them from having any avoidable unsupervised contact with females under the age of 18, also for an indefinite period. They are additionally prohibited from having any contact with their victim.